The format for the following pages of photographs is a departure for me. Partly fine art photography and partly a visual exploration of a piece of mountain geography. The photographs are arranged chronologically on the page, and sequentially with one page per day, creating a visual journal. I have included a number of panoramas that try to give a sense of the sweep of the country. In this project I am trying to get down a feel for the land and trying to put a bit of myself into it. Previous to this trip, I had spent very little time in the Wind Rivers. I can remember the excitement I felt years ago when I first looked at topo maps of the range (I am a lover of topo maps). I marveled at the hundreds of large alpine lakes, curving down in great jeweled strings from high sculpted peaks. To walk in such a place! 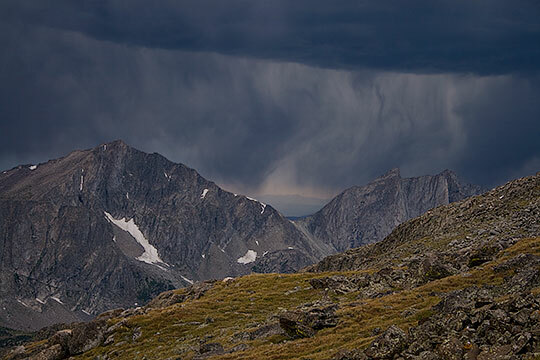 I am familiar with landscapes of glacially carved mountain granite from earlier years wandering in the Sierra Nevada and more recently in nearby Rocky Mountain National Park. There is very beautiful, impressive country in RMNP. There is just much more of it in the Wind Rivers, stretching along both sides of a 100-mile long crest. I already yearn to return. So many mountains, so little time. Spending time in the Wilderness has had special meaning for me for over forty years. The hours stretch into days and the days into real time. The feeling of freedom, freedom to wander, to contemplate, to be awake to the wind and the incomparable beauty. I suspect in many important ways, I feel fully at home in the high mountains, or perhaps, as my desert and canyon wanderings have shown me, in any really wild country. I have gravitated toward employment (or unemployment, the more desirable state for a wandering artist) that would let me spend a lot of time living out of a backpack far from any road. Time has always been more valuable than money. Photography as art, as passion, is inextricably bound up in my delight in the curve of rock, the feel of bark, the emptiness and impermanence of cloud. And so I spend time in wild country to photograph, and I photograph to be in wild country. Some livelihood flows out of this if I am lucky. Much of the Wind River Range and all of this backpacking trip was in federally designated Wilderness. I cannot embark on a trip like this without giving thanks for what has been protected from mining, logging, road building, and vehicles. I thank all the people who worked to protect this land for their wisdom. The protection is important to wildlife, endangered species, and native ecosystems - all interrelated. I also treasure watching the rain fall on an alpine lake in some far-off trailless basin, as I sit peacefully under the overhang of a giant boulder, perhaps as a Taoist Chinese poet might have done over a thousand years ago. Now, as a medicare card-carrying oldster, I fight the tendency to give up backpacking and try to ignore the voice that says, "Man, this pack is heavy, really heavy, and it hurts, and I am really slow carrying it." My solution has been to slowly replace some of my old heavy gear with some new ultra-light stuff, and to depend more on backcountry skills than on equipment. The difference has been revelatory. It is a pleasure to carry a lightweight pack. So I'm off and running into a new renaissance of mountain madness. Stay in shape, be healthy, and walk far. It's a three to four hour slow drive on an increasingly rough dirt road, southeast of Pinedale, to get to the Big Sandy trailhead, which is one of the Wind River Range's most popular jump-off points. There were 55 vehicles at the trailhead when I arrived. Even though the country opens up in many directions from the trailhead, I was still surprised to run into as few people as I did - rarely more than a half dozen backpackers per day, and some days no one. My route involved starting on the west side of the range, crossing Jackass Pass on the Divide, traveling north on the east side, then crossing back over Hailey Pass to the west side and returning south to the trailhead. A terrific loop walk of only 40-50 miles - six days of backpacking and three days for day hikes, a modest trip by many standards. But a deeply rewarding one. Below are links to the pages for individual days.